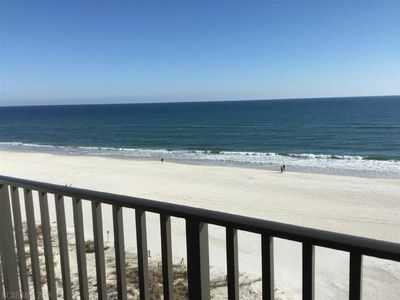 Recently completely redecorated 3 BR/ 3 Bath condo that has panoramic views off TWO balconies overlooking both the Gulf AND the Bay. 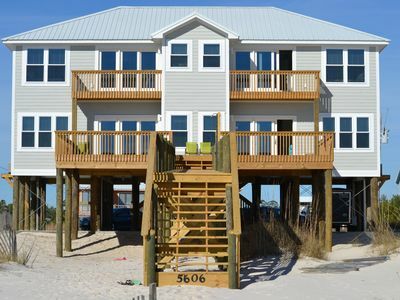 Bel Sole on West Beach Blvd is perfect home away from home beach getaway of your dreams. With almost 2,000 Sq ft of generous open concept living it allows plenty of room for a large family or that perfect group getaway. This isn't your average cookie cutter condo. This is doing the beach with comfort and style. (Min age 25 to rent) VRBO/HOMEAWAY listing only. 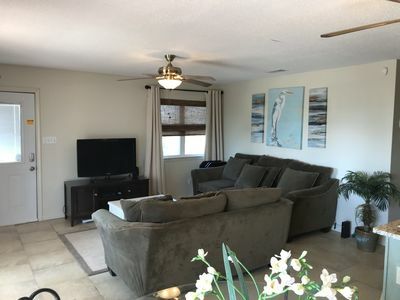 This condo is situated on a narrow strip of land that straddles the Gulf of Mexico and Little Lagoon on highly sought after West Beach Blvd. With only 3 units per floor you will enjoy more privacy than the large mega condo complexes. 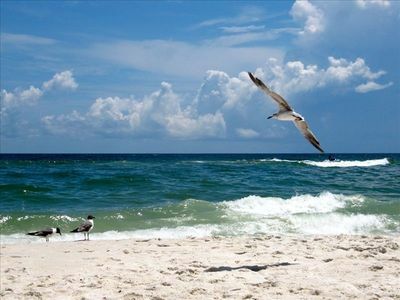 You will love the unobstructed views down miles of beaches along the Gulf and the tranquility of the lagoon. 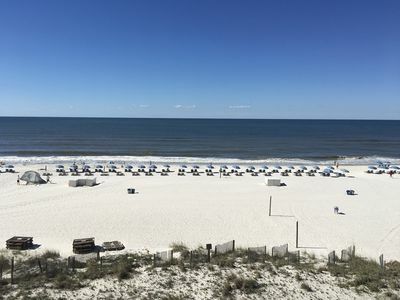 Sit and relax on either of the patios overlooking both the Gulf of Mexico and the Little Lagoon. 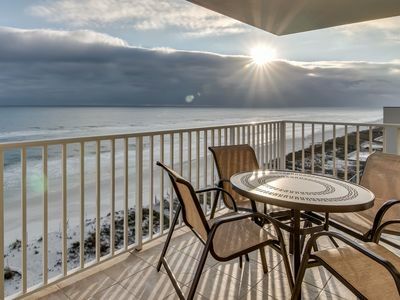 You will enjoy both the sunrises and stunning sunsets that aren't viewable from the condo's that have patios that only face the Gulf. Sit comfortably playing games, or watching movies on Netflix in the spacious living room. Enjoy dinner inside on the rustic farmhouse table (seats 8) or with a view on the rear deck (seats 6). 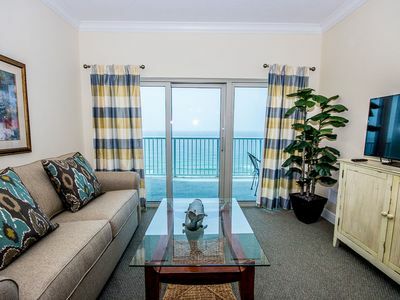 At almost 2000 sq feet, you won't feel cramped and looking for places to sit like most condo's on the beach. 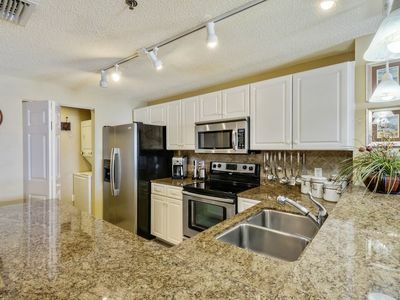 The fully equipped kitchen boasts stainless steel appliances, a Keurig, an ice maker, a wet bar, separate drink refrigerator, wine chiller and breakfast bar with 3 stools. Need to do some work? 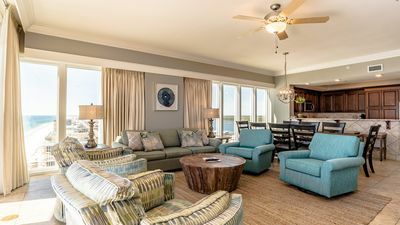 The living room includes a work desk with Wi-Fi and amazing view of the Gulf Shores beach/skyline for your computer/printer. 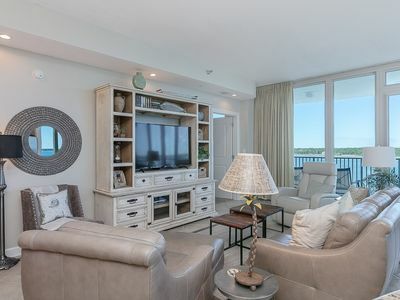 No matter where you are in the condo you will enjoy the incredible multi water views with FLOOR TO CEILING WINDOWS! This unit is unique that it includes so many large beds and suites. The master suite has a KING bed, private bathroom and floor to ceiling windows that boast an amazing view of the picturesque Gulf of Mexico. The oversized master bathroom has views that allow you to see the calming ocean as you get ready in the morning or take a bath in the large jetted tub. 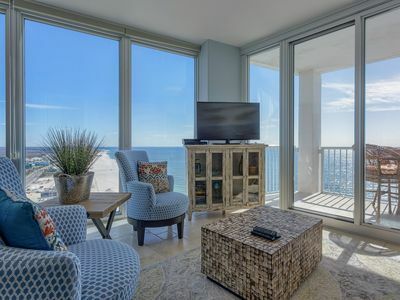 A balcony connects the two suites with a large shared gulf balcony to start or end your day. 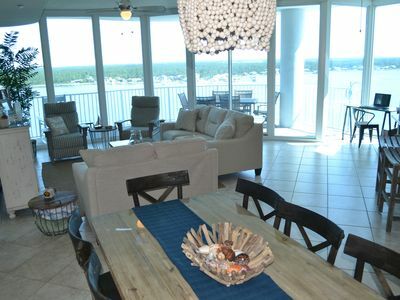 The secondary suite has the same balcony view as the master, KING bed and private bathroom with a view of the gulf. The 3rd bedroom includes a QUEEN bed and a BUNK bed with a floor to ceiling window that has a view down coast. Want to sit outside and relax? You have choices. 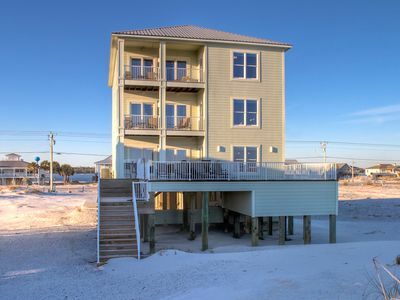 The front balcony has views of the white sandy beach, the deep blue of Gulf of Mexico and the Gulf Shores skyline. The back balcony has relaxing rocking chairs with views of the Little Lagoon, lots of wildlife and calming dock lights. 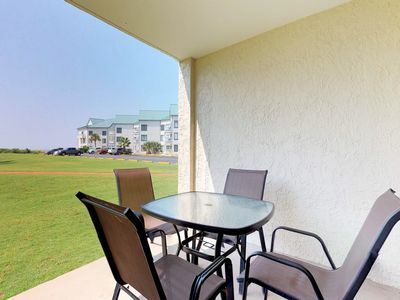 Since the unit is higher up you will have unobstructed views of sunrises and sunsets. Bel Sole only has 3 units per floor, interior entryways and private beach access only for Bel Sole guests which gives you less of a crowd than the mega condo's with 1000's of people where you often sit 3 or 4 family's deep on the beach. West Beach is highly sought after since it offers a more intimate beach experience but still is close to all the action. Bel Sole has 2 pools and a hot tub. One indoor pool, one outdoor pool and a relaxing hot tub all overlooking the beautiful lagoon. The dock is for Bel Sole guests to fish, swim and is perfect if you want to rent a paddle board or kayak. The on-site gym overlooking the indoor pool with a water view will get your blood pumping and ready to tackle the day. Don't settle for a small cramped outdated condo with a limited view and no sunsets. 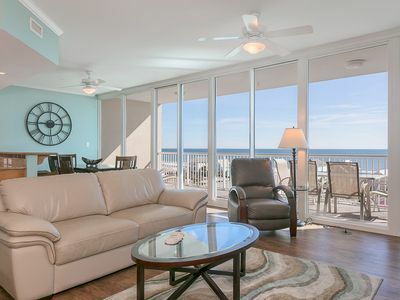 You deserve a vacation condo rental with it all. Property Details : Eastern corner unit with 2 balconies. 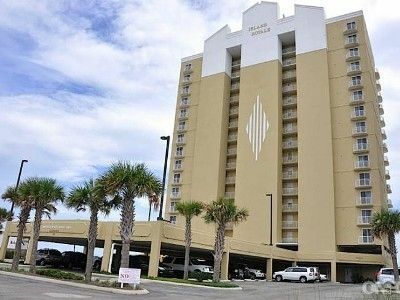 High Speed Internet & Wireless Wi-Fi - Work Desk - Stainless Steel Appliances - Ice Maker - Drink refrigerator - Keurig - Wine Rack - 3 HD Smart TV's with complementary Netflix and another other HDTV - Floor to Ceiling Windows - Beach Locker with beach items included. VRBO/HOMEAWAY LISTING ONLY. Never listed on Craigslist. Limit of 2 parking passes. This is our personal residence that we take care of and maintain for our own personal use and not a bare bones rental only property. We will also take care of you personally to make sure you have a great stay. Your satisfaction is our primary goal. It books fast so don't delay! 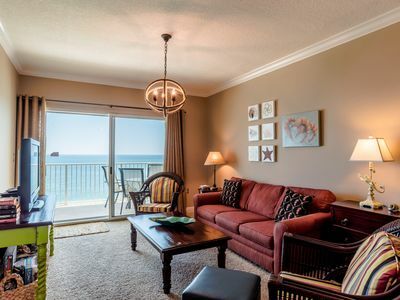 Top Rated Beachfront Condo-Managed by Owner! BOOK YOUR DATES NOW FOR SUMMER AND SPRING 2018! NEW LISTING! 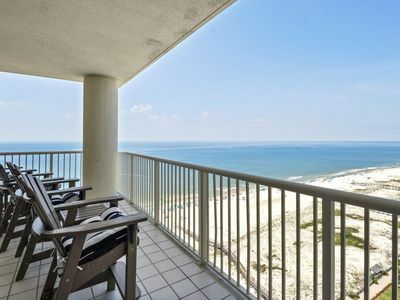 Gulf front condo with fun for everyone - resort amenities & wifi! 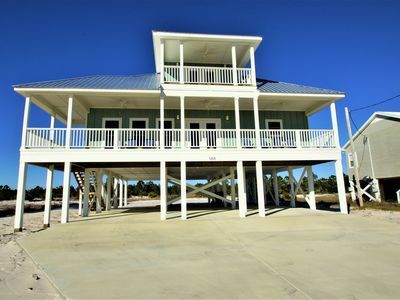 Gulf Getaway, Brand New Home! 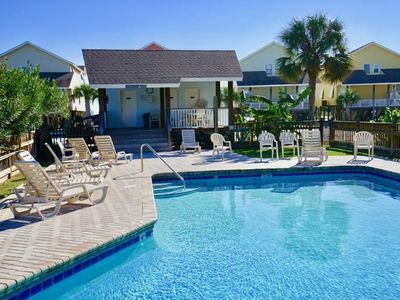 Use code SPRINGFUN2019 & save $$ online~Sleeping 8~Corner Unit!! Hangout Headquarters! 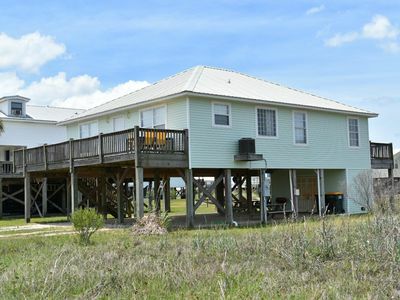 3 Bedrooms 3.6 Miles from the Festival!